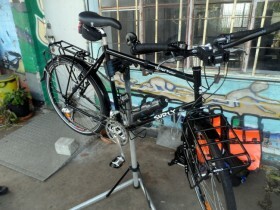 As much as we hope it doesn’t happen, things WILL need fixing on the bikes. Whereas in the past I just toddled down to the bike shop, flashed some cash and all would be hunky dory a few hours later (at the most), that’s just not going to happen while on a long distance tour. Punctures we can deal with but it\’s not going to be a good look if we are stuck in the middle of the Nullabor with dodgy gears, a broken chain, sticky brakes or a broken spoke. A lot of the guys I used to ride with in days gone by seemed to know exactly what to do but I never found out how they learned as it didn’t occur to me that I’d even need those skills. Thinking back I guess someone showed them, they did a course, they read a book or “Googled” the problem. Maybe they just figured stuff out…. 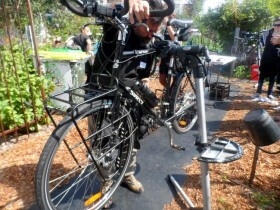 …and as part of achieving that mission they run monthly bike maintenance courses in both Freemantle and Perth. Tim signed up for last Saturday’s course in East Perth and I went along to take some pictures and see what the program was all about. Bottom line – it was awesome. There were 7 attendees, 3 girls and 4 guys including Tim. Most were keen around town cyclists on some pretty basic bikes and none of them had much idea of the mechanics before the course. By the end, they could all perform a complete brake and gear service and fix any problems that might occur with either, including the front and back derailleurs. Pat, the instructor, was an excellent communicator. He ensured everyone firstly had an understanding of how each of the components worked before then explaining how to adjust and fix them. He drew pictures where necessary and patiently guided each participant through the process until he was sure they were competent. 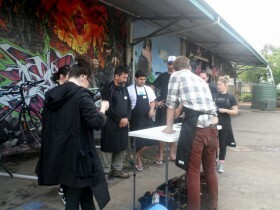 For the other attendees these new skills mean they will save a heap of money in the future. For us it could be a matter of continuing on with our trip of a lifetime rather than having to do some pretty expensive back-tracking to get things fixed.